Applications are only accepted April 1 – June 30. April 1 – April 15: Current FBOCS families may begin submitting applications. April 16 – April 30: New families who are members of First Baptist Church Opelika may begin submitting applications. May 1 – June 30: All other new families may apply. Membership with FBOCS is limited, and registration closes once our membership is full. 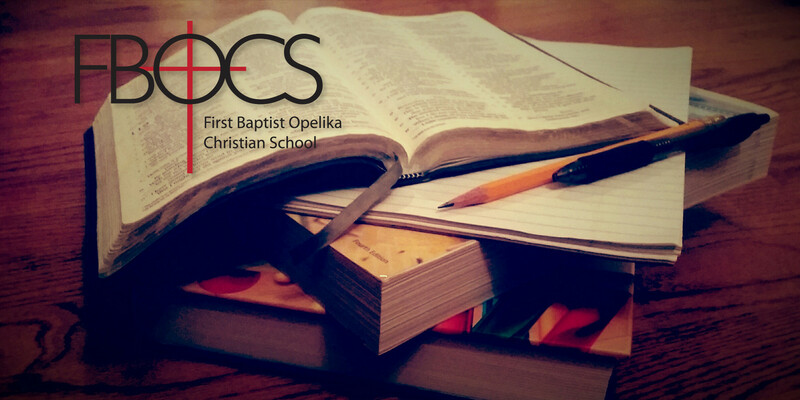 Carefully read the online FBOCS Handbook to determine if First Baptist Opelika Christian School could be right for you and your family. Contact the FBOCS Administrator at info@fbocs.org to inquire about membership availability. If registration is still open, you will be emailed a link where online application forms may be completed. Once the online forms have been submitted, the FBOCS Administrator or Principal will contact you to schedule an interview. If your membership is approved, you will be provided an online member account where you can complete additional online forms and print forms that must be signed and returned to FBOCS along with the applicable fees, made payable to First Baptist Church Opelika: a $35 one-time, nonrefundable application fee; an annual tuition fee of $150 (or $50 for associate members); and an annual high school fee of $50 for one high school student or $75 for two or more high school students. All full members of FBOCS must acquire a membership with the Home School Legal Defense Association (HSLDA) by July 15. Contact the FBOCS Administrator for group discount information. Associate members are exempt from the HSLDA membership requirement. FBOCS requires standardized test scores for students in grades 4 and 8. Tests must have been administered by a non-family member and scored by an independent testing service. If no such scores exist, plan to test students in grades 4 and up during your first year with FBOCS. All application forms and fees are due no later than June 30. Your FBOCS membership will not be considered finalized until all signed forms and fees have been received and membership with HSLDA has been acquired. Partial applications will not be accepted. Signed forms and fees may be delivered to the First Baptist Church Opelika office or mailed to FBOCS, Attention: Enrollment, P.O. Box 329, Opelika, AL 36803-0329.